Today we want to discuss a scary and shocking situation Just recently at Market Street, we saw an apparently healthy, young cat was brought in for a routine visit. While preparing for his vaccines he collapsed and in a matter of sixty seconds was gone. In cats, the most common cause of sudden death is heart disease, more specifically, cardiomyopathy. This disease is typically hereditary and develops early in life but can be secondary to other diseases later in life. Often times this is not detected until after death, on necropsy. Other possible causes of sudden death in cats can be heart worm disease, trauma, toxins, or a urinary blockage. How would we detect heart disease? We may see changes in the heart on an x-ray. There is also a blood test that may be useful. However, the best way to detect this condition is with an echocardiogram, or an ultrasound of the heart. These tests may only be recommended if we hear something on physical exam, if there is the presence of a pre-existing condition, or there is a familial history of heart disease…so many go undetected. It is not uncommon for cats to show no symptoms however, there are some who will have exercise intolerance, rapid or trouble breathing, a chronic cough, lethargy, or a diminished appetite. 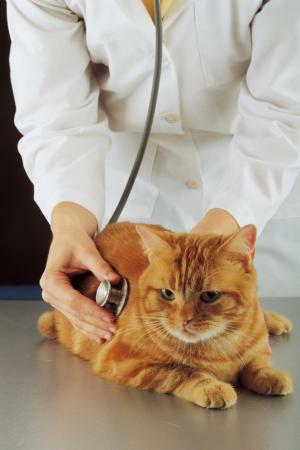 In any case if you have questions or concerns about a behavior or condition in your cat always ask your veterinarian. Be aware that this type of heart disease can reveal itself as early as 4 months of age. The shock of sudden death in any circumstance is an entire aspect of the loss that we mustn’t ignore. Finding answers with a necropsy may help us cope with the tragedy.